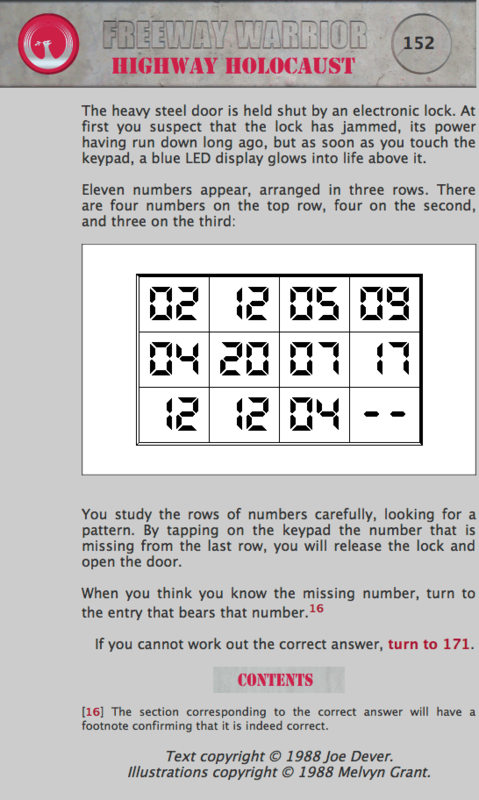 Oooo, a puzzle! How exciting! Given this universe's amazing ability to intuit scientific information just by looking around, hopefully the answer will just come to us, BAM. I'll wait. OK, not so much. Dang. Looks like we'll have to figure this one out ourselves. Take a crack at it and leave your best guess with your reasoning in the comments. Maybe when we get enough that seem reasonable we'll put it up to a vote. Put on those Santa-shaped thinking caps, folks! 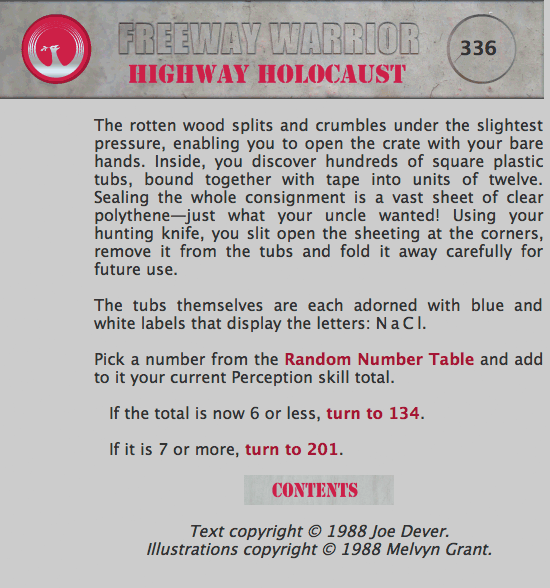 This entry was posted in Freeway Warrior: Highway Holocaust, RPG Corner. Bookmark the permalink. Right, I’ve literally only looked at the puzzle for a few seconds, and I’m shouting the first thought that came into my head. Forgive me if I’m wrong, but don’t you get the last number of each row if you add the first 2 numbers of each row and take away the third number in the row? 2 + 12 = 14, 14 – 5 = 9. 4 + 20 = 24, 24 – 7 = 17. 12 + 12 = 24, 24 – 4 = 20. I think borntobealoser is correct. I came to the same conclusion. 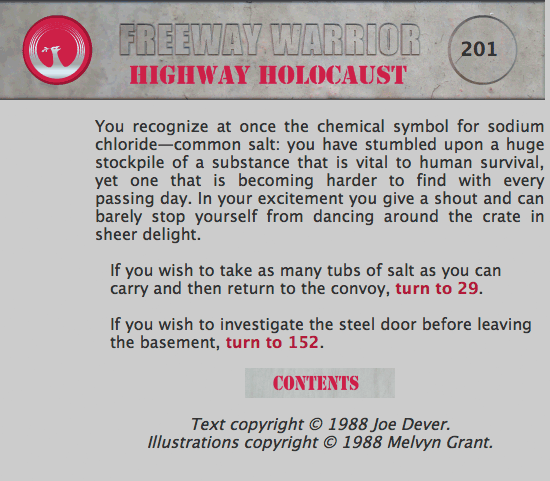 So unless someone has a better idea, 20 seems to be the answer. I arrived at 20 by different means than these two, but still came up with 20 none the less. Is anyone else sitting here with the Butthead face on? I’m gonna leave this one to you guys who are good with the numbers. Dan, you aren’t alone. I honestly jumped to the comments just hoping someone had worked it out. I’m sure if I had more sleep, I’d have been able to work this one out, but for those that have worked it out, I have to agree with the results. I’m willing to go with 20 as well. Damn, borntobealoser, that’s some fast and impressive work! I don’t know if it’s right or not as I haven’t looked it up to see, but it’s certainly a persuasive case. Can anyone come up with an alternative that also makes sense but comes to a different answer? I’ll freely join the “Math idiot” club here as I didn’t see a solution at all. 12 shots of Jaegermeister + 12 beers at the start of a 4 day weekend… -$2000 over Xmas. But, I’m guessing that wasn’t an option. 20 sounds good, but hey, MartianBlue, how’d you arrive at that final +3? Wait, I just noticed: the two columns on the left add up to the same thing as the two columns on the right, so the last two numbers have to add up to 12+12. Yeah, it’s gotta be 20. I really wonder what’s on pg.171. I think MartianBlue somehow got lucky. If what borntobealoser and I thought out is correct, then just about any other combination of numbers that use that method won’t work with MB’s method. I will, however, be the first to congratulate him if his method is the correct one. @spidercow, I’d wager that pg. 171 involves an explosion and our face. I follow that, but it seems awfully like the pattern is being arrived at thru deciding what the unknown number is rather than vice versa. Maybe I’m missing something; it wouldn’t be the first time. And it doesn’t matter anyway: a), postulating an answer and testing it against obsrved phenomena is the scientific method and b) it works, so what am I complaining about?